It started to snow and racecourse is open for skiers to the valley. 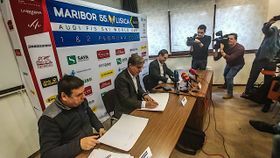 In Hotel Arena, organizers have closed two most significant sponsorship deals with Zavarovalnica Sava as the general sponsor and Nova KBM as the sponsor of giant slalom world cup race. The Golden Fox is on! »Our bank is incredibly proud to be a part of such a big project for so many years now, for more than two decades. We are happy to continue the cooperation in the future. It is good for business as we take into consideration it is our social responsibility to support athletes and organizers. However, even more important are our values, which Golden Fox represents well. These values are competitiveness, brilliance and triumphant mindset and we trying to transfer these values to all our employees. We also strive to be the best. The Golden Fox puts Maribor and Slovenia on the global map and is sends clear message this venue is the place for a great skiing experience«. we have some changes in schedule as giant slalom race starts already on Friday, as competitors must depart on Sunday to world cup event in Sweden. This enables us to create more attractive event for sponsors as they can enjoy the Friday for gatherings and networking. Moreover, we are expecting more pupils to join us at the event.